CINCINNATI -- Xavier University has been the only place in North America since August where pilgrims could journey for a slice of Pizza ATM vending machine pizza. But the gospel of artisanal pizza served hot out of a machine is about to spread across the continent. Colleges and businesses in 20 states and Canada have expressed interest in buying their own Pizza ATM machine, which is a trademark owned by Paline LLC, and the first few successors to XU's may ship in January, according to Alec Verlin, Pizza ATM's product representative. "We purposely pushed back (distribution) for everybody," he said. "We were not prepared that volume of inquiries." Indeed, whether it was the novelty of a Pizza ATM, the quality of the product or some combination, the machine's introduction at XU last summer set off a media frenzy after WCPO first reported its construction. "I’m still giving one or two interviews a week," Jennifer Paiotti, marketing director of XU's auxiliary services, said. Since WCPO published its story on Aug. 4, more than 3,000 newspapers, cable networks, national news magazines and other media outlets have followed, Paiotti said. Consumer interest has translated into a lot of hungry buyers. "At last count, hundreds in discussions for wanting to utilize the same technology and machine," she said. Verlin isn't ready to disclose who the first recipients of new Pizza ATMs will be, but he expects the machines to proliferate all over the country and Canada this year now that Paline, the North American distributor of the pizza vending machines, has established distribution networks. When others do buy the machines, they'll have to trek to Cincinnati to learn how to use them. XU has an exclusive contract with Paline, which is based in Cincinnati, to train any and all Pizza ATM operators in North America at XU's new Pizza Chef School. Sales of pizza from the ATM have cooled off to about 30 to 35 a day after the initial rush when XU sold more than 750 pizzas in a week. 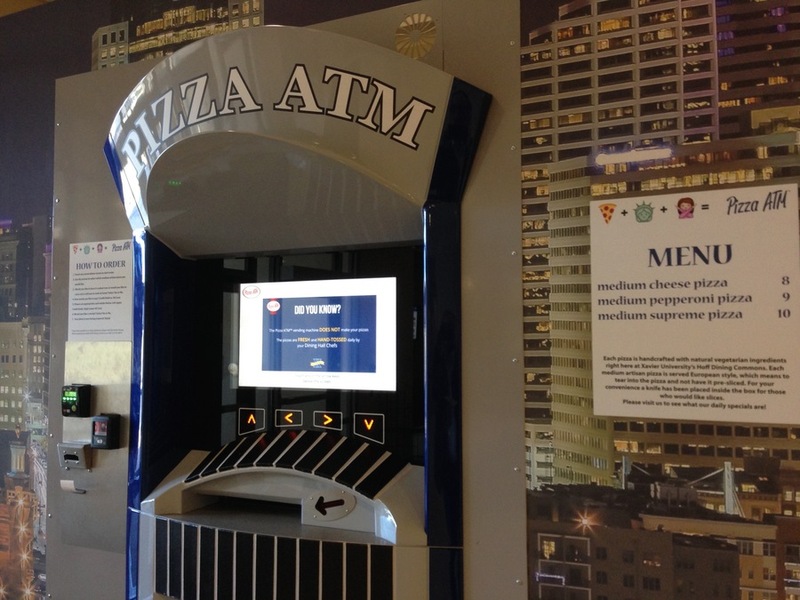 RELATED: EXCLUSIVE: Xavier University's Pizza ATM is up and running. The early reviews? But that rate is a good one as far as XU is concerned, and student and professional marketers will continue to use trial and error to keep interest high. • Cooks prepare a vegan dough -- don't worry, carnivores, pepperoni and sausage can be added later -- and they let it rise for two days. • The dough is kneaded, flattened into 12-inch round crusts and partially baked. • Vegan tomato sauce is made in-house, and all the toppings are prepped in the dining hall too. • Cooks top the crusts with eight varieties of toppings and load them into the refrigerated section of the ATM. • The hungry customer is greeted by a large touch screen, selects a pizza and pays by swiping a student debit card or a credit card. • The machine moves the pizza to a disk, juke-box style, into the convection oven that's fired up to about 425 degrees. When it's done, the pizza is placed in a cardboard box, which ejects through a slot. • Total time from ordering to completion: Three minutes. The Pizza ATM and surrounding walls have already gotten a facelift, changing from a faux brick oven design to photos of the Cincinnati Skyline. Specialty pizzas including Buffalo chicken and chicken bacon ranch will be periodically added to the staple cheese, pepperoni and supreme offerings. Paiotti said XU is preparing to roll out new specialty pizzas that will only be available in the ATM and not inside the school's cafeteria. They're also introducing a loyalty program with discounts and special offers. "It's doing well above expectations," Paiotti said. Follow Bob Driehaus on Facebook , Google , and Twitter .